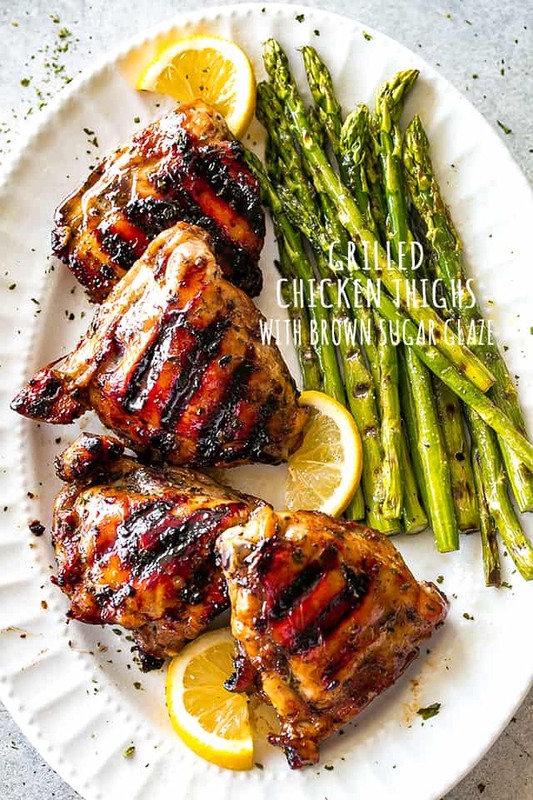 Grilled Chicken Thighs with Brown Sugar Glaze – Juicy, savory-sweet brown sugar glazed chicken thighs grilled to a tender perfection! 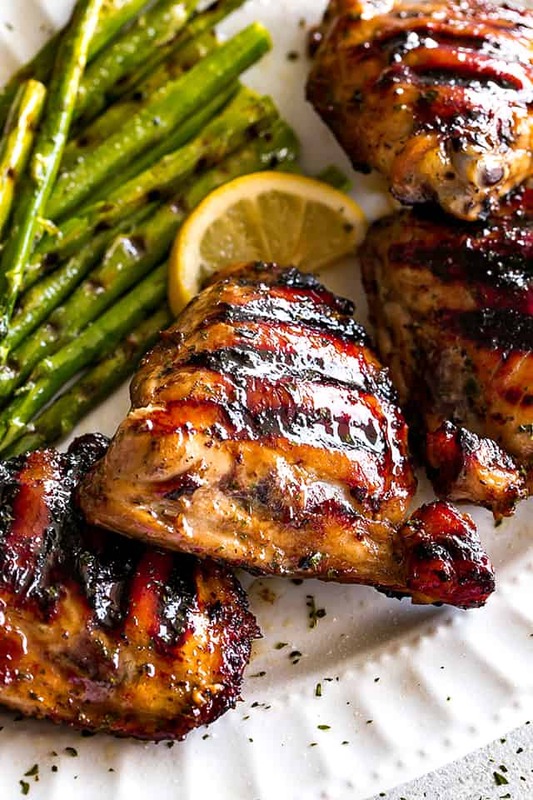 It’s time to crack open the grill and make room for these delicious Grilled Chicken Thighs! They are a little spicy, a bit of sweet and sticky, and a whole lot of amazing! 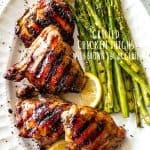 Similar to my Spicy Sweet and Sticky Chicken Thighs, this grilled chicken thighs recipe is also packed with bold flavors that even the pickiest of eaters will want to dive right in. Okay, first of all, let’s pause for a moment of reflection on the fact that summer, technically, is one week away. Let’s also pause for a minute and say a prayer for all those Moms/Dads/Grandparents/Caregivers that work from home and their kids are OFF for the summer Thank You! And so usually the answer to my decision on what to make for dinner on any given summer-night is, chicken on the grill. With Grilled Corn on the side. AND Grilled Peach Shortcakes! Anyways, let’s discuss chicken THIGHS and how to grill ’em! 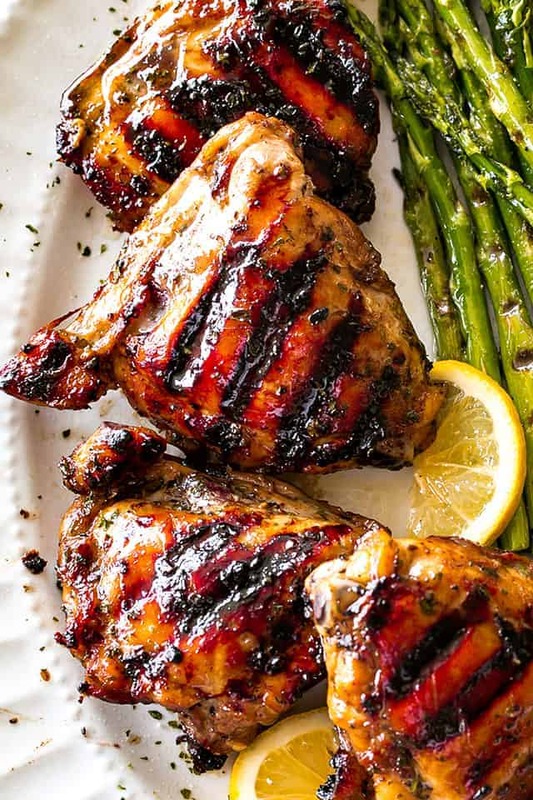 The important steps to really juicy grilled chicken thighs include a really good marinade, trimmed fat, and a hot grill. Getting the best grilled chicken thighs requires just a bit of preparation to make the best tasting thighs that you can make. First and foremost, trim the fat. Pockets of fat cause flare-ups when they hit the grill thus it’s best to trim away any excess fat pockets. Second most important, if not THE MOST important thing is the marinade and/or glaze. 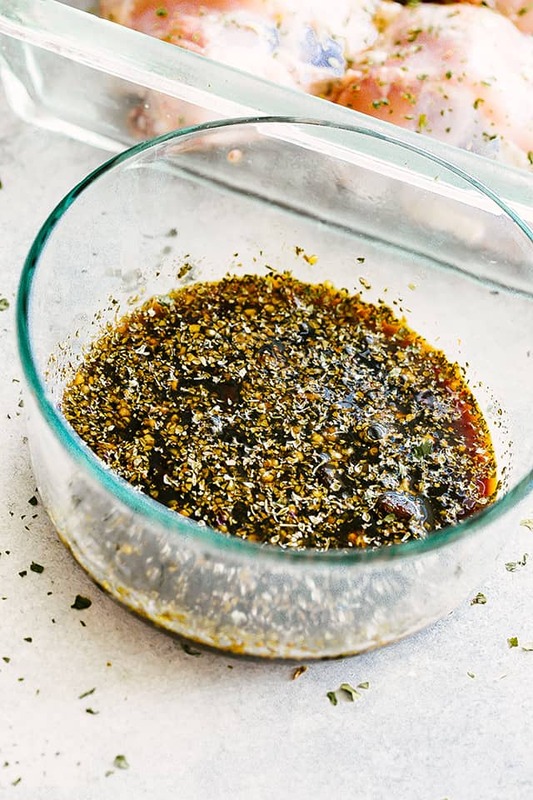 Our delicious chicken marinade, which is also used as a sweet glaze, consists of light brown sugar, soy sauce, hot sauce, garlic, seasonings and herbs. 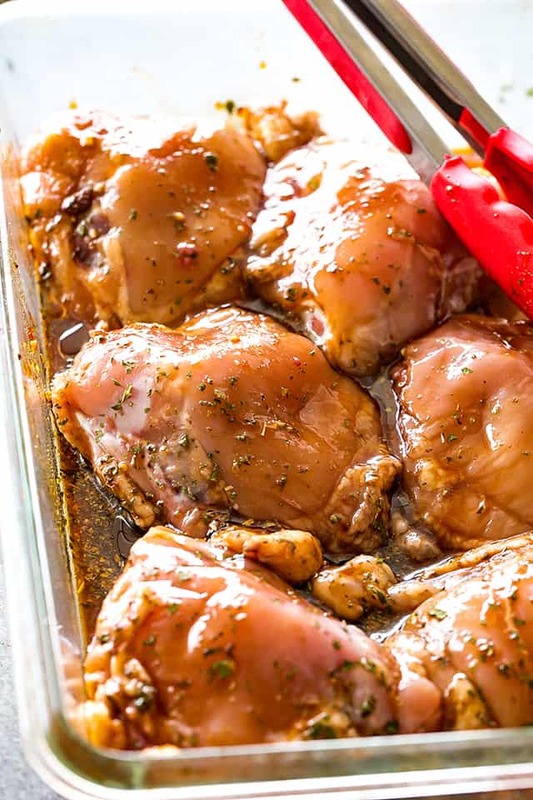 As little as 30 minutes of marinating helps get the best taste out of the chicken thighs, but it’s better to leave them in the marinade for up to 4 hours in the fridge. I make a bit extra on the side so that we can also use it as a glaze or even a dipping sauce. Third, prepare the grill by preheating it to a medium-high heat. I almost always grill the chicken thighs at around 400F to 425F. Before placing the chicken thighs on the grill, please grease the grates with cooking oil. Finally, chicken thighs will need at least 11 to 15 minutes on the grill, depending on their size, but I suggest using a meat thermometer to check for doneness. Boneless, skinless chicken thighs are thoroughly cooked at 165F, but I do not remove them from the grill until they’ve reached a temperature of around 170F to 175F. It’s a personal preference because I find the dark meat to still be a bit tough when cooked to an internal temperature of 165F. Boneless, skinless chicken thighs are a good choice because they cook quickly and don’t dry out even if they are a little overcooked. The chicken marinade would be just as good brushed onto boneless, skinless chicken breasts, or even wings and drumsticks. Leftovers can be stored in an airtight container and left in the refrigerator for up to 3 days. Are you loving the asparagus up there?! Get the recipe for GRILLED ASPARAGUS and let me know if you liked it! If you try a recipe, please use the hashtag #diethood on INSTAGRAM for a chance to be featured! Juicy, savory-sweet brown sugar glazed chicken thighs grilled to a tender perfection! Arrange chicken thighs in a large mixing bowl or dish and set aside. Whisk soy sauce, brown sugar, honey, oil, vinegar, hot sauce, garlic, basil, ginger, and pepper in a mixing bowl. Reserve 1/3 cup of the marinade mixture for later use; pour the remaining of the marinade mixture over the chicken thighs. Cover and place chicken thighs in the fridge for 30 minutes, and up to 4 hours. When ready to cook, remove chicken from fridge and let sit in room temperature for 15 to 20 minutes. Preheat grill to medium-high heat; about 400F to 425F. Brush grill grates with oil. Place the chicken on the grill over direct heat and cook undisturbed for about 5 minutes. Flip the chicken and grill until the second side is browned, 5 minutes more, or until cooked through and internal temperature is at least 165F. When the chicken is nearly cooked through, brush on the reserved marinade/glaze on both sides of the chicken thighs and continue to cook until done. Remove from grill and set aside, covered, for 5 minutes. This was great way to make grilled chicken thighs. I grill a lot of chicken. This is as good as any I have tried. There is a lot of flavor with a nice contrast of sweet and salty. I will save this recipe and will make these tasty thighs again. Adjustment to time for bone in thighs? About 10 minutes per side for bone-in thighs, flipping often until cooked through. 1:12 AM rocking these thighs in your tastey marinade again!! Definitely have to finish off with another rub of marinade when thighs come off bbq. Juicy!! OMG!! i was searching the web to find a low sodium recipe for chicken thighs and stumbled across your website. Am i glad i did, i had all the ingredients on hand and didn’t have to go to the store so i gave it a shot. The recipe is super tasty finger-licking good I enjoyed my dinner immensely thank you for making low sodium eating tasty, i will use this recipe often. I cut the low sodium soy sauce with half water and it was just fine. The sauce is excellent! This looks amazing! totally adding it to my meal plan for next week. I made these tonight!! Juicy, succulent, outstanding!! Going into my regular rotation!! A must try!! You won’t be disappointed!! That glaze! OMG! This looks fantastic! Wow these look sooooo delicious and juicy! Sometimes I get confused about whether a recipe calls for direct or indirect heat on the grill. Which would you use on this one? Thanks. I love how brown and crispy these thighs look! Brown sugar glaze sounds so delicious! Can’t wait to try this! This is such a summer must have meal! So good! Yummy! My kids love anything with brown sugar! I’m on a diet. can I eat this dish? !